Henry caught his first trout more years ago than he cares to admit, and the magic of catching fish has not faded with time or with repetition. His journey in the world of fly fishing began during boyhood over thirty five years ago when he first saw someone fishing with flies they tied themselves. That image was mesmerizing and still remains clear in his mind today. From that day on he's always been a fly tier. The connection between fly fishing, tying flies and the world of the trout is a natural one and the simple beauty of a well crafted fly; built from feathers, furs and fibers and designed for a moment when hatching flies fill the evening air over a pool dimpled by the spreading rings of rising fish is a never ending source of satisfaction and amazement. His career as a fly fisherman began several years later. For years he has been a custom fly-tier tying flies for trout, Atlantic Salmon and classic and artistic full dress salmon flies; and his first book “Matching Major Eastern Hatches, New Patterns for Selective Trout” was released by Stackpole / Headwater Books in January 2011. 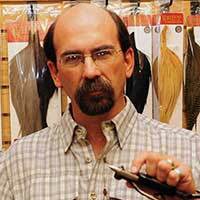 His tying work has previously appeared in the Game Journal, the Art of Angling Journal and the Mid Atlantic Fly Fishing Guide. Tying Dries for the "Film"